As someone interested in science, public debate based on empirical facts, current events and the role of the media, I am extremely interested in this sort of initiative. For one, I find the facts about collective ignorance fascinating. I think everyone should be made aware of human cognitive biases, be them prospect theory, attribution bias, omission bias, confirmation bias, conforming with authority bias, the Weber–Fechner law of logarithmic physical stimuli to perceived intensity, and many many others. I think that awareness of these facts helps to show that error is not necessarily equated with evil or moral dubiousness. It levels the playing field and presents a narrative of errors as opposite to a choice between two polarised camps who attack the other point of view as being intrinsically deceitful, if not evil. I enjoy the argumentative quality of a presentation that is grounded on the facts about of argumentation because it shows that perfectly logical theoretical reasoning can lead to a mistaken conclusion that will be left unchecked in the absence of experimental/empirical facts. Rather than caricaturing different perspectives and antagonising different parties in a discussion, I think it facilitates debate where shouting matches may otherwise prevail. Hans Rosling does this by showing that it is not just some people who are ignorant, but rather the vast majority of us who are outdone by chimps. Hank Green‘s discussion of the anti-vaccination tendencies in the USA for SciShow is another very good example of this, if perhaps more explicit than what is implicit in the entertaining delivery of Rosling. While some may consider it to be existentially depressing it certainly offers a more realistically nuanced view of the world that may perhaps guide us towards a better path for public debate. Surely, if prejudices can be overcome through contact, sonder is the trigger that facilitates the learning and empathy necessary for contact to be successful. The other thing that is interesting about this work is that it addresses a number of other issues that are dear to me. Implicitly, the discussion deals with a form of what Michael Stevens calls “juvenoia“, the concern that this generation is worse-off than the one that preceded it an that as result the future is going to be bad because it is a time when those people will take over. Although it may be possible to stretch this attitude into a form of Neoophobia, a fear of novelty, what it truly is is simply a form of pessimism, which is clearly repetitively unwarranted. So again, our prejudices allow the chimps to embarrass us. If you’ve worked even superficially with income distributions you very quickly realise that the field has been plagued by a fundamental problem of limited data collection and therefore limited information availability. This is because data collection only occurs sporadically for this type of variable and often the data collected is meant to serve many different purposes, of which describing the income distribution is only one. So when I see a beautifully crafted dynamic income distribution such as the one discussed by Hans Rosling, I’m immediately suspicious, because it seems to good to be true; it seems like it is doing something that cannot be done. However, we are not done yet. I still thought the whole thing was a bit iffy. Sure I had found the data and I had found the graphs, but while everything else is very transparent and easily accessible, that certainly did not seem to be the fact with income distribution. There was no neat single income distribution source (even if the world bank kind of does a good job of it). This was bugging me because Gapminder did not seem to acknowledge that, which I was starting to think was a bit dishonest and was kind of ruining the whole positive feeling I had gotten from finding this resource. Except that they are indeed transparent! If you go to that website and have a look at the graph, you will find in the top left-hand corner a warning sign, that you can click. When you do the following message appears (click on the image below to display a readable version of the picture) describing the complexity of sources and methods underlying the computation of the values necessary to generate the graphs before. The result is a work in progress, that probably has a lot of gaps and a lot of estimated rather than observed values and most likely than not a considerable amount of assumptions behind it. 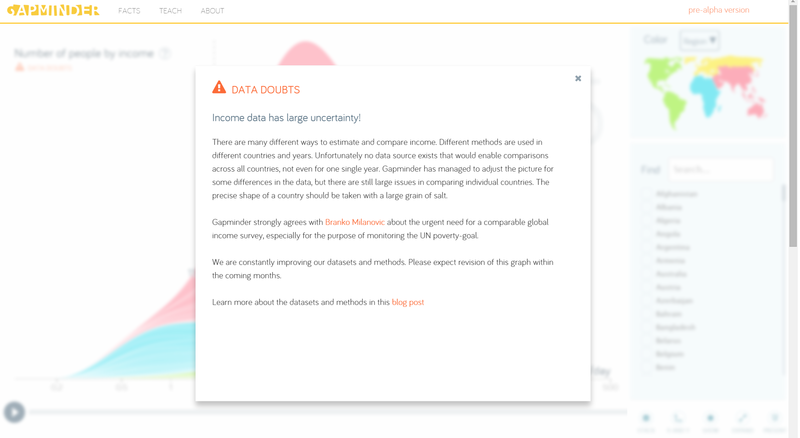 You cannot just go onto the World Bank website and download this data, which beyond the income shares downloadable from Gapminder’s website probably include other data as well (the reference to the work of Branko Milanovic may suggest as much). 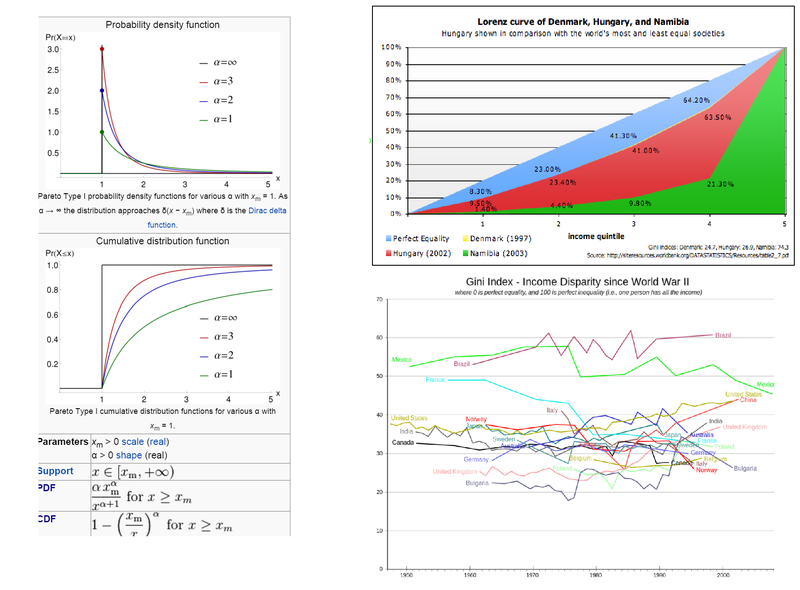 However, it is still most likely the best estimate of the evolution of income distributions available out there. So good for Gapminder for admitting that, still making the data available and warning that many revisions to this graph are likely to occur. If you watch a couple of videos from Gapminder you realise that the entire presentation has gone through several iterations, probably reflecting this sort of data revisions. The “camel -to-dromedary” discussed in the Berlin TedTalk I used to introduce this discussion for example is not mentioned this video (06min23sec), where two humps characterise the data. 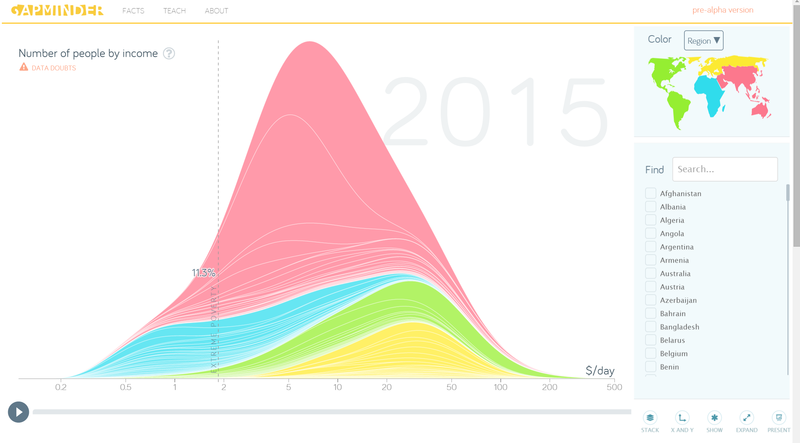 So while the data sources issue was bothering me from one side, I was also getting annoyed by the shape of the income distribution I was looking at. So why does Gapminder’s data look different? There’s no deceit, fraud or ill purpose at work. You can put your paranoia to rest. The answer is provided by Hans Rosling himself at 8min30sec of this video, where he states that “of course it’s a logarithmic scale here”. So yes, the reson why the income distribution looks like a normal distribution is because we are measuring income in logs. What does that mean? You may have already realised this from watching the presentation, but if you didn’t the hint is in the scale of the horizontal axis, where the space between $1 and $10 is the same as between $10 and $100. The income values were logged, so what we are looking is a graph that projects the probabilities of certain income level against the log (presumably at base 10) of the income level. It is in effect a transformation that turns an power law income distribution into a log-normal distribution. If you want tor read a little bit about this I also recommend Limpert, Stahel and Abbt (2001:349), who provide a relatively accessible discussion of log-normal distributions across different fields.. This might sound like an obscure point to make, but if you know your stats, what that means is that the graph grossly underestimates the contribution of the richest members of society vis-a-vis the poorest. The only way in which I assume that this fact does not undermine the point that Hans Rosling is trying to make is if the point is not about any single country’s income inequality but rather about income inequality between what people have traditionally referred to as Advanced Economies (read Western, i.e. : OECD) and Developing Countries (i.e. : Africa, LatAm and Asia). And for this purpose a log-normal representation of income is completely appropriate. Everything he says about the fact that the share of non-OECD countries among the top 20% of world income still holds true. All the visual cues you are getting are appropriate except if you want to think about inequality within the countries, in which case a log-normal distribution hides the fact that the rich have become much richer than the poor. Of course, the share of people in extreme poverty has shrunk from an estimated 85.9% of the world’s total population in 1800 to a mere 11.8% in 2014, even as their total number has increased from 815 million to 853 million people. It is also pretty clear from the data that Africa is a bit of an exception to the other regions, accounting for a disproportionate share of the world’s population living in extreme poverty nowadays. But clearly there’s been an improvement and this is good. If you ask most economists what drives economic growth, you are likely to hear us say something along the lines of physical and human capital, good institutions and perhaps some reference to the fact that this varies depending on what your initial level of development is. The implication is that all you need is a good education system, a decent infrastructure (decent roads, decent railways and decent sanitation) and a stable political system that minimises corruption and you are good to go. This is not necessarily very helpful because it has absolutely nothing to say about what “good”, “decent” or “stable” mean in their respective contexts. However, and this is where I’ll stop, the points about healthcare and education made by Hans Rosling are completely consistent with standard economics.